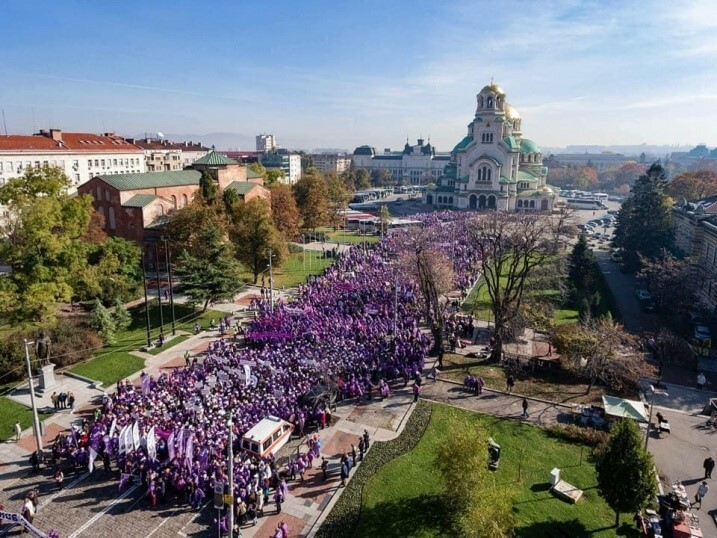 Some 10,000 Bulgarian workers flooded the streets of Sofia on 27 October demanding decent incomes and workers’ rights. Members of the Confederation of Independent Trade Unions (CITUB) from all over the country joined the march to the Council of Ministers. IndustriALL Global Union affiliates from around the world expressed their support for workers in Bulgaria at the organization’s Industry 4.0 World Conference held in Geneva on 26-27 October 2017. The conference included representatives from Bulgarian affiliates, the Light Industry Federation (FOSIL-CITUB) and Metalicy. Backed by workers from all sectors, CITUB president, Plamen Dimitrov, handed a declaration to the government and employers at the demonstration. “Everyone must have a monthly salary increase of at least 100 BGN (US$59) for the current year, irrespective of the sphere they work in: a school, a hospital, in administration, in the mines, in a shop. This is what people want to say today,” said Dimitrov. The protest also focused on defending social benefits. Additional payments for experience and length of service (seniority bonuses) have failed to compensate for the fall in the value of wages in Bulgaria. The CITUB protest declaration was read at the rally before being handed to Social Affairs Minister Biser Petkov and business representatives taking part in a meeting of the National Council for Tripartite Cooperation at the Council of Ministers. “We want the Prime Minister’s personal commitment to include our country in the upcoming EU Alliance for upward wage convergence,” announced Plamen Dimitrov. Unions in Bulgaria say they want wages to match those in other countries in Europe, such as France, Germany, Sweden and the Netherlands, and not remain the backyard of Europe. “We want a solution from Prime Minister Borisov now. Our struggle continues on the road to higher wages,” explained Dimitrov.